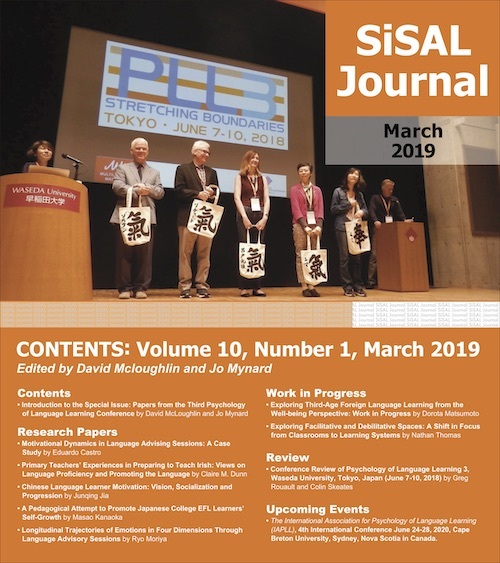 Welcome to the March 2011 issue of SiSAL Journal, a special issue on skills development and practice in the field of self-access learning. We received a number of interesting submissions related to language skill areas as we had hoped. In addition, some contributors interpreted the theme in a broader sense and this has led to this very interesting and varied issue. Self-directed learning is an important skill area, particularly in the context of self-access learning. So, as you will see, we touch on both linguistic and non-linguistic development in outside class learning. The first article is by Paul Kei Matsuda and Michelle Cox and addresses some of the difficulties experienced by writing centre tutors when helping second language writers. The authors present some strategies that may be of help to writing centre tutors, particularly if they have not had much experience with reading the work of second language writers. The second full article by Hayo Reinders and Cem Balcikanli focuses on the development of autonomous learning skills. The authors present a framework for establishing whether commonly used teacher training course books provide new teachers with information about promoting autonomy. The results of the study indicate that many textbooks do not adequately focus on the development of skills for supporting autonomous learning in students and this has implications for the field of self-access learning. Continuing the theme of developing autonomous learning skills, in her perspectives piece, Rania K. Jabr emphasizes how it is not sufficient for language teachers to focus only on language instruction, particularly when dealing with poorly prepared or unmotivated learners. The author draws parallels with alternative teaching theories and gives examples of some self-assessment and peer feedback activities that can be useful for helping students to become more autonomous and function as self-directed learners. There are two summary pieces in this issue. The first one was written by Holly Marland and is an account of her experiences with establishing a book club in Korea. The author drew on the principles of extensive reading and aimed to create opportunities for learners to enjoy reading and to take an active role in the discussions and in the organization of the club. Members of the editorial team regularly work with language learners in a self-access centre and were so impressed with one particular online tool for helping learners to develop their speaking skills that we solicited the second summary piece from the makers themselves. We were interested in learning more about the “Splendid Speaking” website including its origins and its key features and were delighted that founder of the UK-based company Splendid Learning, Peter Travis, provided us with a useful summary. The final article is a work in progress piece contributed by Katherine Thornton. The author, along with a colleague, developed a series of strategy sheets to be used in the self-access centre where she works in Japan. The sheets provide suggestions for strategies in language skill areas and can be used by learning advisors, teachers or learners. I hope readers will enjoy this issue and find some practical value for their work. I am particularly pleased with the range of contexts represented in this issue and contributions have come from the UK, Turkey, South Korea, Japan, Egypt and the USA. We are now accepting submissions for upcoming themed issues. Please check the website for details. Many thanks to the contributors for choosing to submit their work to SiSAL Journal, to the reviewers who gave perceptive and timely feedback and to the editorial team once again for their input, support and sharp-eyed editing skills. I wish our outgoing associate editor, Kentoku Yamamoto, the best of luck in his new life.